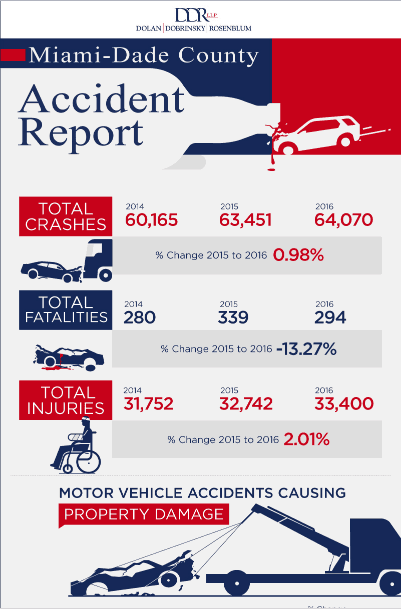 This infographic gives a visual representation of the most recent motor vehicle accident report of Miami-Dade County. In general, vehicles continue to get safer in today's world but there are still 600,000 motor vehicle accidents that happen in South Florida annually. This infographic shows the number of accidents involving fatalities, injuries, accidents involving drugs and alcohol, the age and the demographics of those involved. Dolan Dobrinsky Rosenblum, LLP hopes that his will help raise awareness about motor vehicle accidents and help others see that the actions of one night out on the town, texting a friend or not being focused on driving can cause unnecessary hurt and problems in the lives of those involved. The lawyers of Dolan Dobrinsky Rosenblum, LLP have 77 years of collective personal injury law experience to help you in the court of law. If you or a loved one has been injured in a motor vehicle accident call 305-371-2692 for a consultation.